LEDs, a bigger PSU, and a ton more ports sure sound nice. Razer's new Core X Chroma eGPU cabinet adds a bigger power supply, Intel's newest Thunderbolt 3 controller, and probably most importantly: Chroma RGB support. The original Core X featured a 550-watt PSU to power GPUs. With the Core X Chroma, Razer moves up to 700 watts. That probably sounds excessive, as even fairly beefy GPUs can run with well under 550 watts of power but Razer said folks should remember the cabinet has to have enough power to allocate up to 100 watts for charging a laptop as well. Besides the PSU bump, Razer has added four USB Type-A ports and Gigabit Ethernet to the Core X Chroma eGPU. 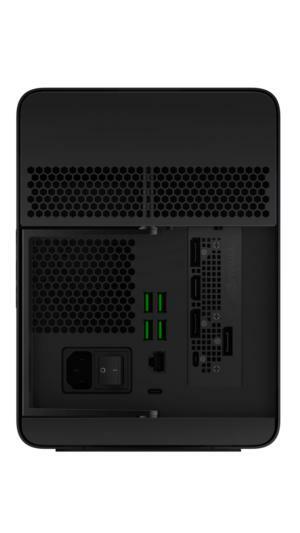 The original Core X functioned purely as an external GPU cabinet with no downstream connectivity. Razer's new Core X Chroma goes up in price but adds an RGB Chroma feature and Intel's new Titan Ridge Thunderbolt 3 controller. Razer said it was able to add to I/O ports in the Core X Chroma by integrating two of Intel's newest "Titan Ridge" Thunderbolt 3 controllers. Titan Ridge actually came out earlier last year, but the chipsets are still relatively rare in peripherals and laptops. Titan Ridge brings DisplayPort 1.4 support, poised to take over from DisplayPort 1.2. Perhaps more importantly, Titan Ridge also supports a USB-C fallback mode, which should allow the controller to work with more hardware. With the Core X Chroma, Razer officials said the two Titan Ridge chips allow it to support all of the additional hardware in the cabinet. The last touch, sadly, is what people will focus on: the Chroma RGB support. Razer's Chroma support means the cabinet's two lighting zones can automatically sync up with your Razer Chroma laptop, your Razer Chroma mouse and your Razer Chroma mouse pad. The original pricey Razer Core V2 supported Chroma RGB, so this will be the first time the Chroma makes it into a lower-cost eGPU. No surprise, the new features don't come for free. Razer said the new Core X Chroma will cost $400. That's $100 more than the original lower-cost Core X, but less than the first Core's price tag of $500. 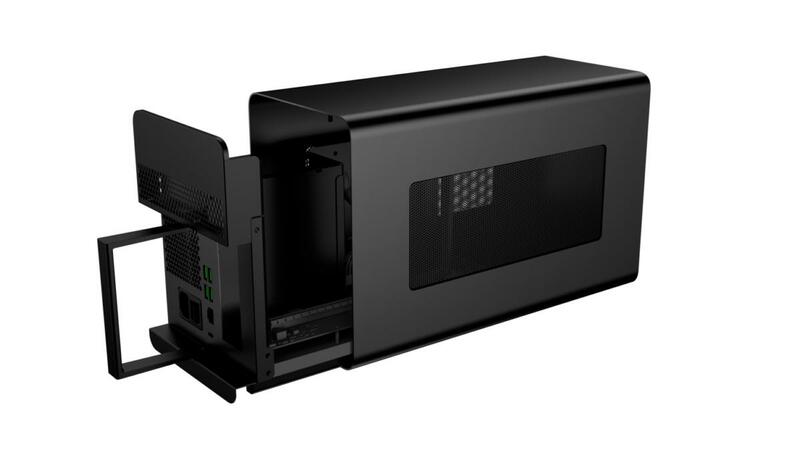 The Core X Chroma has a three-slot bay and can accept up to a GeForce RTX 2080 Ti as well as Quadro P6000 and Quadro GP100 GPUs. On the AMD side, Razer said up to the newest Radeon VII cards are supported. Razer's new Core X Chroma supports up to the GeForce RTX 2080 Ti and AMD's Radeon VII.